From the Peabody Essex Museum in Salem, MA, Panorama of a Whaling Voyage. It was painted by Thomas Davidson around 1860. The scroll is 13 inches high and 34 feet long. The viewing box is unusual in that the sides of the box are covered in fabric. For more information about this moving panorama, click on the link below. Special thanks to the Peabody Essex Museum for granting permission to use these images. Visit the PEM! Panorama of a Whaling Voyage, Peabody-Essex Museum (PEM) Salem, Massachusetts. Used with permission. A scene from the Arctic. 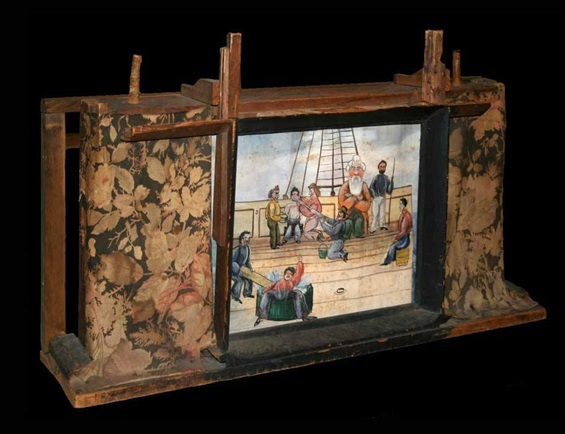 Panorama of a Whaling Voyage, Peabody Essex Museum, Salem, Massachusetts. Used with permission. Panorama of a Whaling Voyage, Peabody Essex Museum, Salem, Massachusetts. Used with permission. 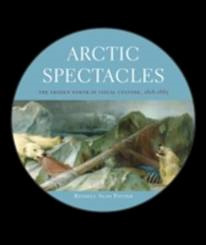 Arctic Spectacles by Russell A. Potter, published by the University of Washington Press in 2007. Thanks to moving panorama historian Prof. Russell Potter, for telling me about this "crankie'sized" moving panorama. He has written about this moving panorama and others in the book Arctic Spectacles - The Frozen North in Visual Culture, 1818-1875. If you are interested in 19th Century Artic explorations, check out Russell's blog Visions of the North. Visit the Crankie Factory's page on Polar Panoramas.